Duchenne muscular dystrophy (DMD) is characterised by progressive loss of muscular strength that leads to an increasingly restrictive pulmonary syndrome. However, it is still not clear whether this determines alterations in the breathing pattern. We studied: 66 DMD patients at different stages of the disease (mean±sem age 12.6±0.6 yrs, range 5–22 yrs of age), subdivided into four groups according to age; and 21 age-matched healthy male controls. Spirometry, lung volumes and nocturnal oxygen saturation were measured in all DMD patients. Ventilatory pattern and chest wall volume variations were assessed by optoelectronic plethysmography during spontaneous breathing both in seated and supine positions. Whilst in a seated position, no significant differences were found between patients and controls or between different age groups. In the supine position, the average contribution of abdominal volume change (ΔVAB) to tidal volume progressively decreased with age (p<0.001). The patients who showed nocturnal hypoxaemia showed significantly lower ΔVAB. In conclusion, chest wall motion during spontaneous breathing in awake conditions and in supine position is an important indicator of the degree of respiratory muscle impairment in DMD. ΔVAB is not only an important marker of the progression of the disease but is also an early indicator of nocturnal hypoxaemia. Duchenne muscular dystrophy (DMD), a lethal progressive muscle wasting disease with an incidence of one in 3,500 live male births 1, 2 is associated with loss of muscle function over time. Loss of respiratory muscle strength, with ensuing ineffective cough and decreased ventilation, leads to pneumonia and respiratory insufficiency both during sleep and while awake. Respiratory failure is due to the loss of respiratory muscle strength, causing reduced lung and chest wall compliance, decreased ventilation, alveolar hypoventilation, ineffective cough, hypercapnia and hypoxaemia 3–5. It is the commonest cause of death in DMD patients, usually when there is a severe and generalised disability. The onset of respiratory insufficiency can be subtle and most DMD patients are not aware that they have lost respiratory muscle strength and that their cough is less effective. Traditionally, respiratory evaluation in DMD patients includes patient history and physical examination, measurement of pulmonary function, and assessment of sleep-disordered breathing. Up to now, respiratory problems in DMD have been mainly described in terms of reduction of vital capacity 6 and inspiratory muscles weakness 7–9. These descriptors, although very useful, are not unique determinants of the worsening of respiratory function in DMD. In fact, it has been reported that some patients with extremely low values of vital capacity can breathe autonomously, while others need constant ventilatory support 10. In addition, there are difficulties associated with the methods currently used to assess respiratory function in DMD patients. Volitional tests of lung and respiratory muscle function, such as spirometry and maximal respiratory pressure tests, require a high level of patient cooperation. Other methods, based on pressure measurements and magnetic and/or electrical stimulation of the respiratory muscles, are more invasive and are not well tolerated by patients. The aim of the present study was to determine whether detailed analysis of chest wall kinematics could identify new parameters associated with the respiratory aspects of disease progression. To achieve this, we used optoelectronic plethysmography (OEP) 11–13, a technique which does not require patient collaboration and allows a completely noninvasive breath-by-breath measurement of chest wall volume (VCW) and its different compartments. We tested the hypothesis that in DMD the progressive loss of respiratory muscle strength determines alterations in the pattern of spontaneous breathing that precede and anticipate the onset of nocturnal hypoxaemia and respiratory failure. 66 patients affected with DMD were recruited. The diagnosis was made on the basis of traditional diagnostic criteria: progressive muscular deficit resulting in severe motor disability; increased muscle plasma enzymes; muscle biopsy identifying muscular degeneration and absence of dystrophin; alterations in the DMD gene (deletions, duplications or point mutations) 2. The DMD population was subdivided into four groups according to age. Group I: ≤7 yrs; group II: ≥8–≤12 yrs; group III: ≥13–≤16 yrs; group IV: ≥17 yrs (table 1⇓). 21 healthy male subjects (mean±sem age 13.5±1.4 yrs, height 158±5 cm, weight 52±6 kg) were recruited as controls and subdivided according to the same age groups as the DMD patients. Four subjects were ≤7 yrs of age (5.0±0.4 yrs of age, height 117±5 cm, weight 22±3 kg), five were ≥8–≤12 yrs of age (9.4±0.4 yrs of age, height 139±2 cm, weight 32±2 kg), six were ≥13–≤16 yrs of age (15±0.5 yrs of age, height 174±3 cm, weight 61±6 kg), and six were ≥17 yrs of age (21.1±1.8 yrs of age, height 179±2 cm, weight 80±8 kg). Within group I of the DMD patients, all patients were still ambulant, without scoliosis or heart dysfunction. Within group II, seven patients were still ambulant, eight presented with scoliosis (mild in two patients (Cobb angle <20°), moderate in four patients (Cobb angle 20–40°), and severe in two patients (Cobb angle >40°) and two presented with mild or severe heart dysfunction. In group III, 11 patients presented scoliosis (mild in three, moderate in five and severe in three) and one underwent spinal fusion. Heart dysfunction was observed in six patients (mild in one patient and moderate in five). In group IV, 13 patients presented scoliosis (mild in eight, moderate in four and severe in one) and two underwent spinal fusion. Only one patient was under treatment with nocturnal noninvasive ventilation (NIV). Heart dysfunction was present in 10 patients (mild in two, moderate in seven and severe in one). All patients with cardiac dysfunction (independent of group) were taking β-blockers or angiotensin-converting enzyme inhibitors, or both treatments. None of the patients presented symptoms of additional diseases, such as cerebral palsy, behavioural and/or psychiatric disturbances, acquired brain or spinal injuries, epilepsy, allergies or asthma. All patients (or parents of the patient in the case of children) signed a written informed consent form, as approved by the Local Ethical Committee of the IRCCS “E. Medea” Institute. The study was approved by the institute's Human Ethics Committee according to the declaration of Helsinki. Measurements of forced vital capacity (FVC), forced expiratory volume in 1 s (FEV1) and peak expiratory flow (PEF) were performed in a seated position with a flow meter attached to a flanged rubber mouthpiece, with the nose occluded (Vmax series 22; SensorMedics, Yorba Linda, CA, USA). Subdivisions of lung volumes (functional residual capacity (FRC), residual volume (RV) and total lung capacity (TLC)) were measured using the nitrogen washout technique (Vmax series 22; SensorMedics). Nocturnal pulse oximetry (Nonin 8500; Nonin, Minneapolis, MN, USA) was performed in all patients. Kinematics of the chest wall and its different compartments were studied using OEP (OEPSystem; BTS, Milan, Italy) both in the supine 11, 12 and seated positions 13. 52 reflective markers were placed over the anterior chest wall surface from clavicles to pubis, and after a period of adaptation, patients were analysed in the supine position (fig. 1a⇓) during 3 min of spontaneous quiet breathing in awake diurnal state. Experimental set-up for the analysis of chest wall volumes via optoelectronic plethysmography in a) supine and b) seated positions. For measurement in the seated position (fig. 1b⇑), an 89-marker configuration (as described in 13) was used in the healthy subjects and in the DMD patients who were able to maintain a static trunk position. For patients analysed while seated in a wheelchair, the same marker configuration as adopted for analysis in the supine position was used. Each marker was tracked in three-dimensions by eight special infrared video cameras positioned around the patient at a sampling rate of 60 Hz. For volume computation, the chest wall surface was approximated by a set of triangles connecting the markers, and standard algorithms provided the measurement of the total VCW and its different thoraco-abdominal compartments: pulmonary ribcage (where the action of inspiratory and expiratory ribcage muscle is present), abdominal ribcage (where the diaphragm is attached) and the abdomen (VAB; where both the diaphragm and the expiratory abdominal muscles act) 14, 15. From total and compartmental VCW tracings, the following parameters were considered: tidal volume (VT) as the average total VCW variations, respiratory rate, minute ventilation (V′E) and percentage contribution of the different compartments to VT. Differences between the four groups of DMD patients when control data were not available (such as spirometric and subdivision of lung volume data) were evaluated using parametric one-way ANOVA, with age group as the independent factor. In the cases in which the data were not normally distributed, a nonparametric Kruskal–Wallis one-way ANOVA on ranks was applied. Differences between the four groups of DMD, when control data on healthy subjects were available (such as for ventilator parameters and kinematic data), were assessed using the same two-way ANOVA test, with age and pathology as the independent factors. Post hoc tests were based on Holm-Sidak and Dunn methods, for parametric and nonparametric ANOVA tests, respectively. To compare data between groups of patients with significant nocturnal oxygen desaturation (DeSat group) and all DMD patients belonging to groups III and IV, an unpaired t-test and a Mann–Whitney rank sum test were applied where the data were and were not normally distributed, respectively. Finally, to compare data between groups of patients with differing severity of kyphoscoliosis (present or absent) in the different age groups, a two-way ANOVA test was performed. The p-values reported in the Results section were attained using the one- or two-way ANOVA tests. All data are expressed as mean±sem. Differences were regarded as significant at p≤0.05. In table 1⇑, the results of pulmonary function tests are shown as average values of the different groups. Only two patients belonging to group I could perform reliable spirometry, due to poor collaboration in performing the manoeuvres and/or in keeping the mouthpiece in place. Therefore, representative mean values for group I are not reported. A progressive reduction of FVC, FEV1 and PEF average values was observed with increasing age when expressed as % predicted values (p<0.001). Conversely, subdivision of lung volume data showed a significant trend between the different groups only when expressed as absolute values, increasing from groups II to IV (TLC, p = 0.043; RV and FRC, p<0.001). In table 1⇑, the results of the nocturnal arterial oxygen saturation measured by pulse oximetry (Sp,O2) are reported as the following percentages of the night-time spent with Sp,O2: 95–100%, 90–94%, and <90%. 10 patients, three belonging to group III and seven to group IV, spent ≥10% of the night-time with Sp,O2 <95%. These patients were considered as forming a further group for following analysis (DeSat group), and were compared to the overall group of patients belonging to groups III and IV. 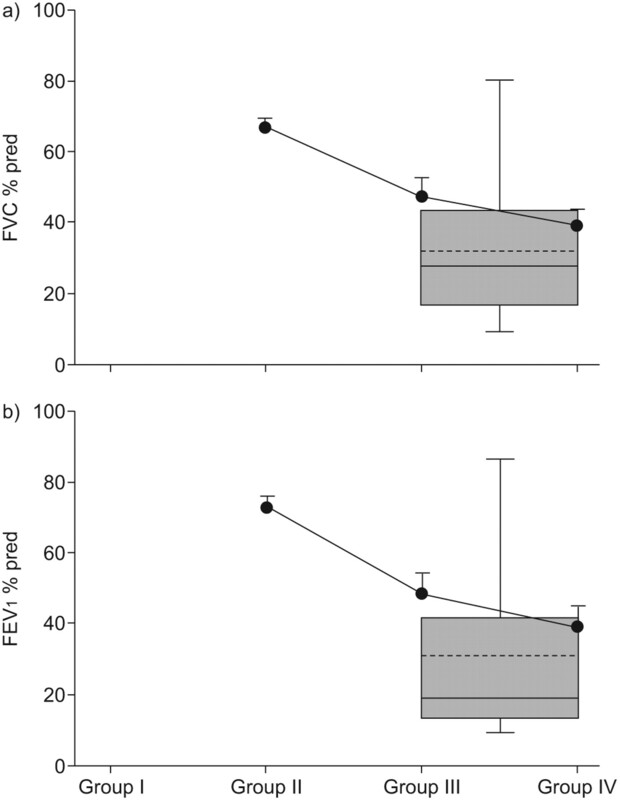 Figure 2⇓ shows the progressive decreasing average values of FVC and FEV1 in the different groups. Patients of the DeSat subgroup presented values lower than the overall groups III and IV (FVC 31.9±22.1% and FEV1 30.9±24.9%) but the difference did not reach statistical significance (p = 0.109 and p = 0.085, respectively). Mean±sem (•) of a) forced vital capacity (FVC) and b) forced expiratory volume in 1 s (FEV1) in the different groups of Duchenne muscular dystrophy (DMD) patients (data for patients belonging to group I not available). Box plots present the distribution of a) FVC and b) FEV1 in DMD patients belonging to groups III and IV, spending ≥10% of the night with arterial oxygen saturation measured by pulse oximetry <95% (DeSat group). Boxes show the 25th and 75th percentiles, the median (—) and the mean (---); whiskers present the 10th and 90th percentiles. % pred: % predicted. 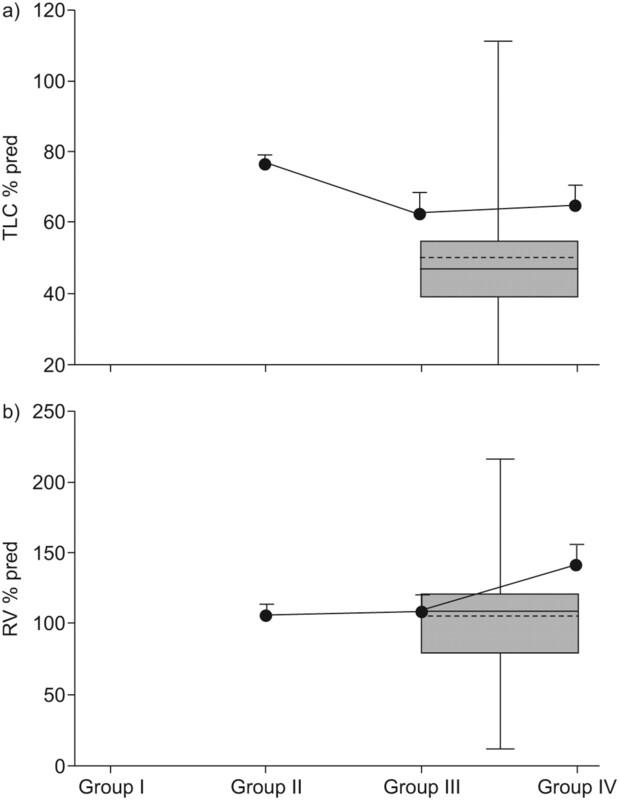 The same behaviour was observed for TLC and RV average values (fig. 3⇓). Patients belonging to the DeSat subgroup showed average values (TLC 50.4±26.7% and RV 106.1±55.7) that were not statistically different to the overall group III and IV data (p = 0.081 and p = 0.378, respectively). Mean±sem (•) of a) total lung capacity (TLC) and b) residual volume (RV) in the different groups of Duchenne muscular dystrophy (DMD) patients (data for patients belonging to group I not available). Box plots indicate the distribution of a) TLC and b) RV in DMD patients belonging to groups III and IV, spending ≥10% of the with arterial oxygen saturation measured by pulse oximetry <95% (DeSat group). Boxes show the 25th and 75th percentiles, the median (—) and the mean (---); whiskers present the 10th and 90th percentiles. % pred: % predicted. Figure 4⇓ shows the mean breathing frequency, VT and V′E for both controls and DMD patients in supine and seated positions. 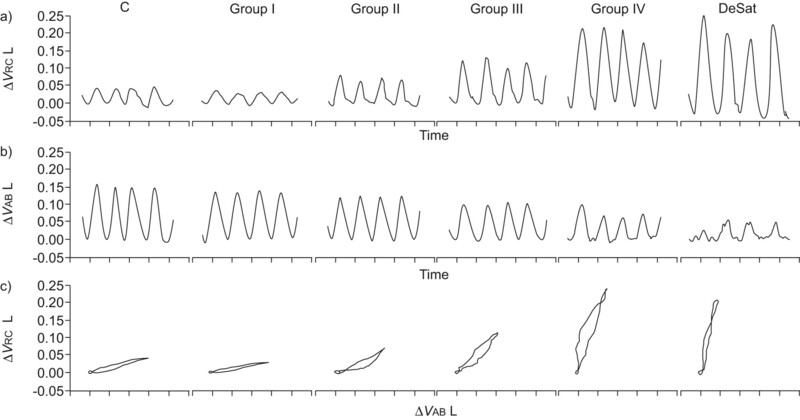 Mean±sem (○ and •) of a and d) breathing frequency, b and e) tidal volume (VT) (variation in chest wall volume), and c and f) minute ventilation (V′E) in the different age groups in supine (a–c) and seated (d–f) positions. •: Duchenne muscular dystrophy (DMD) patients; ○: healthy controls. Box plots present the distribution of the corresponding values in DMD patients belonging to groups III and IV, spending ≥10% of the night with arterial oxygen saturation measured by pulse oximetry <95% (DeSat group). Boxes show the 25th and 75th percentiles, the median (—) and the mean (---); whiskers present the 10th and 90th percentiles. *: p<0.05 versus group II; **: p<0.01 versus group I; ***: p<0.001 versus group I. In the supine position, VT of DMD patients in groups III and IV was significantly lower than normal (p = 0.012 and p = 0.027, respectively). Breathing frequency was only slightly different between controls and patients (p = 0.041). Consequently, V′E followed a similar pattern in both DMD patients and controls (p = 0.088) (fig. 4a–c⇑). In the seated position, breathing frequency was independent of age (p = 0.295) and no differences between DMD patients and healthy controls (p = 0.953) were present. Conversely, both VT and V′E increased with age (p<0.001) and were significantly higher in healthy controls than in DMD patients in the groups II, III and IV (p<0.001). No differences were seen in these variables between patients in the DeSat subgroup and the overall groups III and IV, both in the supine and in the seated position. 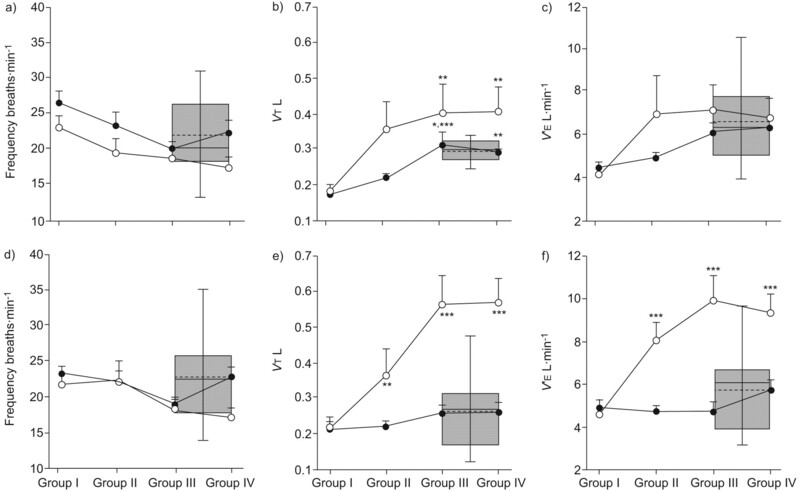 In the supine position, in group I the average contribution of VAB variation (ΔVAB) to VT was similar to that observed in healthy control subjects, but it progressively decreased with age, from group I to group IV (p<0.001; fig. 5a⇓). Mean±sem (○ and •) of abdominal volume (ΔVAB), expressed as percentage of total tidal volume of the different age groups in a) supine and b) seated positions. •: Duchenne muscular dystrophy (DMD) patients; ○: healthy subjects. Box plots indicate the distribution of ΔVAB in DMD patients belonging to groups III and IV , spending ≥10% of the night with arterial oxygen saturation measured by pulse oximetry <95% (DeSat group). Boxes show the 25th and 75th percentiles, the median (—) and the mean (---); whiskers present the 10th and 90th percentiles. **: p<0.01 versus group I; #: p = 0.001 versus group II; ¶: p<0.01 versus group III; ***: p<0.001 versus groups III and IV. Figure 5b⇑ presents the percentage contribution of abdominal compartment to VT in the DMD patients and healthy controls in a seated position. No significant differences were seen between patients and controls (p = 0.510) or between different age groups (p = 0.863). Patients belonging to the DeSat subgroup showed no differences in the abdominal contribution in a seated position, while a statistically significantly lower average value (p<0.001) compared to the overall groups III and IV was present in the supine position. Figure 6⇓ shows thoraco-abdominal kinematic analysis in a set of representative cases. With increasing age, the percentage contribution of abdomen to VT progressively decreases with a corresponding increase of ribcage contribution. This can be seen also in the VRC versus VAB plots (fig. 6c⇓), in which the slope is progressively increasing and the loops become generally wider, suggesting an increased asynchrony between the ribcage and the abdomen. Within groups III and IV, this altered pattern was particularly evident in the patients belonging to the DeSat subgroup. Representative cases of thoraco-abdominal volume changes during spontaneous breathing in the supine position in a healthy control subject (C), and in Duchenne muscular dystrophy (DMD) patients belonging to groups I–IV and the patients with significant nocturnal oxygen desaturation (DeSat group). a) Volume changes of the ribcage (ΔVRC), b) volume changes of the abdomen (ΔVAB) and c) ΔVRC versus ΔVAB. With increasing age, the percentage contribution of the abdomen to tidal volume progressively decreases (79% in C; 80% in group I; 63% in group II; 47% in group III; 23% in group IV; 18% in DeSat) with a corresponding increase of ribcage contribution. The presence of scoliosis did not influence any of the ventilatory pattern measurement (VT, breathing frequency and V′E) or kinematic measurement (contribution of the different chest wall compartments to VT) variables in either posture. Early diagnosis of respiratory problems and especially respiratory muscle weakness is essential in the clinical care of DMD patients. The present study, performed on a large number of DMD patients and healthy controls, showed that it is possible to identify subtle disease stages in relation to changes in the breathing pattern of patients who can be measured noninvasively. During spontaneous breathing, significant differences between DMD patients and controls, as well as between different age groups of DMD patients, clearly emerged only when the contribution of chest wall compartments to VT were considered in the supine position. In this posture, the features of the ventilatory pattern in DMD patients followed a trend of increasing age similar to that found in healthy subjects (fig. 4⇑). As was expected, VT increased with age both in DMD patients and in healthy controls, but less so in the former. The dystrophic patients tended to maintain a slightly higher frequency than healthy subjects, which determined values of total V′E similar to those of healthy subjects, up to groups III and IV. This pattern indicates that DMD patients cope with the progression of the disease by adopting a strategy that allows them to maintain an adequate V′E. However, striking differences emerge when the contribution of the different chest wall compartments to VT are taken into consideration (fig. 5⇑). In healthy subjects in the supine position, the abdomen contributes to VT by ∼70% on average (and, correspondingly, the ribcage contributes by ∼30%); this contribution does not depend on age. In DMD patients there is a progressive and significant reduction from group I to group IV (70 to 40%, respectively; p<0.001) in the contribution of the abdomen, with a corresponding increase in the contribution of the ribcage compartment (30 to 60%). Surprisingly, the presence of scoliosis did not influence any parameter in either posture. The only significant differences found in the seated position were in VT and V′E between DMD groups II, III and IV, and controls. These findings may indicate that DMD patients of these three groups can hypoventilate, with consequent elevation of arterial carbon dioxide tension in this posture. A limitation of the present study is that OEP measurements of ΔVAB and ΔVRC changes may be considered as indirect assessments of ribcage muscles and diaphragm function. We deliberately chose to avoid more invasive measurements, such as oesophageal, gastric and transdiaphragmatic pressures, in order to minimise the invasive nature of and the instrumentation involved in these techniques. For similar reasons, other methods were not considered in the present study for the evaluation of inspiratory muscle function based on the assessment of transdiaphragmatic and oesophageal pressures generated during volitional (sniff and cough manoeuvres) and nonvolitional (magnetic or electrical stimulation of the phrenic nerve) tests 7–9. Nevertheless, our data from healthy subjects are fully consistent with those obtained in previous studies, which showed a reduction of ribcage motion and an increase of abdominal excursion in the supine position relative to the sitting position 16, 17. This is partly due to the increase in abdominal compliance and the decrease in ribcage compliance in this posture 18, and partly to the different geometry of the diaphragm in the supine position 19, which is stretched by the viscera and consequently has a higher passive tension. In contrast, our DMD patients showed a behaviour that changed with age, suggesting a progressive impairment of the diaphragm action. The fact that ribcage compartment contribution increases and abdominal compartment contribution decreases with increasing age may suggest that, in order to maintain V′E within physiological ranges, DMD patients cope with the progressive impairment of the diaphragm by increasing the recruitment of the inspiratory ribcage muscles. However, presumably inspiratory ribcage muscles (intercostals, parasternals, scalene and neck muscles) are also progressively impaired like all skeletal muscles, meaning the adopted strategy might be useful only over limited periods of time. To verify this hypothesis over long periods of time, longitudinal studies are ongoing. Another important result of the current study is the correlation that we found between the degree of nocturnal oxygen desaturation and the daytime characteristics of breathing. Sa,O2 significantly decreased during the night in a significant number of patients belonging to groups III and IV. In these patients, the abdominal contribution to VT was significantly lower when compared to that of all patients belonging to groups III and IV. It is noteworthy that this difference is present in the supine but not the seated position. It must be emphasised that early signs of ventilatory problems, namely diaphragm impairment, initially occur only in the supine posture. It is known that in this position, the diaphragm is the main contributor to VT. It can therefore be hypothesised that only in the supine position will the effects of the early signs of diaphragm impairment initially be observed. The assessment of nocturnal hypoxaemia is clinically relevant. It is currently considered to be a marker of disease progression and is one of the indices used as a guide for the intervention of NIV during the night 20, 21. Smith et al. 22 have previously shown that although V′E when awake is normal in DMD, hypoventilation occurs in all sleep stages, and patients with diaphragmatic dysfunction are especially vulnerable to oxygen desaturation during rapid eye movement sleep. Other previous observations have also shown that sleep-related hypoventilation and hypoxaemia occur in the presence of diaphragm dysfunction 23, 24 and are particularly evident in rapid eye movement sleep, when muscular atonia is maximal and the diaphragm should be the only respiratory muscle active 23, 25, 26. In conclusion, our study presents several novel issues. We considered a wide range of ages, focusing our attention on the different stages of the disease progression. We performed a noninvasive analysis during awake conditions and we found a relationship between the breathing pattern in these conditions and nocturnal variations of oxyhaemoglobin desaturation. Specifically, we found that the contribution of abdomen to total volume during spontaneous breathing in awake conditions seems to be a strong indicator of diaphragm impairment, which occurs at different times in different patients. These indicators are complementary to the assessment of respiratory function traditionally provided by spirometry 27–29 and have the great advantage of not requiring patient cooperation, motivation and coordination. We believe that our results are clinically relevant and will allow early identification of a subgroup of patients in need of more attention and more frequent evaluations before eventually intervening with noninvasive mechanical ventilation. This work was supported by a grant of Fondazione Cariplo: Health Innovation Network Technology @ Lecco (HINT@Lecco). The authors are indebted to the children and their parents for their participation in the study. Special thanks also go to A. Degrate (IRCCS E. Medea, Bosisio Parini, Italy) and S. Ippolito for their assistance in statistical analysis. Griggs RC, Bushby K. Continued need for caution in the diagnosis of Duchenne muscular dystrophy. Neurology 2005;64:1498–1499. Howard RS, Wiles CM, Hirsch NP, et al. Respiratory involvement in primary muscle disorders: assessment and management. Q J Med 1993;86:175–189. Kalra M, Amin RS. Pulmonary management of the patient with muscular dystrophy. Pediatr Ann 2005;34:539–545. Gozal D, Thiriet P. Respiratory muscle training in neuromuscular disease: long-term effects on strength and load perception. Med Sci Sports Exerc 1999;31:1522–1527. Phillips MF, Quinlivan RC, Edwards RH, et al. Changes in spirometry over time as a prognostic marker in patients with Duchenne muscular dystrophy. Am J Respir Crit Care Med 2001;164:2191–2194. Nicot F, Hart N, Forin V, et al. Respiratory muscle testing: a valuable tool for children with neuromuscular disorders. Am J Respir Crit Care Med 2006;174:67–74. Man WD, Moxham J, Polkey MI. Magnetic stimulation for the measurement of respiratory and skeletal muscle function. Eur Respir J 2004;24:846–860. Hart N, Polkey MI, Sharshar T, et al. Limitations of sniff nasal pressure in patients with severe neuromuscular weakness. J Neurol Neurosurg Psychiatry 2003;74:1685–1687. Ellis ER, Bye PT, Bruderer JW, et al. Treatment of respiratory failure during sleep in patients with neuromuscular disease. Positive−pressure ventilation through a nose mask. Am Rev Respir Dis 1987;135:148–152. Aliverti A, Dellaca R, Pelosi P, et al. Compartmental analysis of breathing in the supine and prone positions by optoelectronic plethysmography. Ann Biomed Eng 2001;29:60–70. Aliverti A, Dellaca R, Pelosi P, et al. Optoelectronic plethysmography in intensive care patients. Am J Respir Crit Care Med 2000;161:1546–1552. Cala SJ, Kenyon CM, Ferrigno G, et al. Chest wall and lung volume estimation by optical reflectance motion analysis. J Appl Physiol 1996;81:2680–2689. Kenyon CM, Cala SJ, Yan S, et al. Rib cage mechanics during quiet breathing and exercise in humans. J Appl Physiol 1997;83:1242–1255. Aliverti A, Cala SJ, Duranti R, et al. Human respiratory muscle actions and control during exercise. J Appl Physiol 1997;83:1256–1269. Vellody V, Nassery M, Druz W, et al. Effects of body position change on thoracoabdominal motion. J Appl Physiol 1978;45:581–589. Druz W, Sharp J. Activity of respiratory muscles. J Appl Physiol 1981;51:1552–1561. Estenne M, Yernault JC, DeTroyer A. Rib cage and diaphragm-abdomen compliance in humans: effects of age and posture. J Appl Physiol 1985;59:1842–1848. Quaranta M, Salito C, Magalotti E, et al. Non-invasive three-dimensional imaging of human diaphragm in-vivo. Conf Proc IEEE Eng Med Biol Soc 2008;1:5278–5281. Finder JD, Birnkrant D, Carl J, et al. Respiratory care of the patient with Duchenne muscular dystrophy: ATS consensus statement. Am J Respir Crit Care Med 2004;170:456–465. Wallgren-Pettersson C, Bushby K, Mellies U, et al. ENMC: 117th ENMC workshop: ventilatory support in congenital neuromuscular disorders - congenital myopathies, congenital muscular dystrophies, congenital myotonic dystrophy and SMA (II) 4–6 April 2003, Naarden, The Netherlands. Neuromuscul Disord 2004;14:56–69. Becker HF, Piper AJ, Flynn WE, et al. Breathing during sleep in patients with nocturnal desaturation. Am J Respir Crit Care Med 1999;159:112–118. Labanowski M, Schmidt-Nowara W, Guilleminault C. Sleep and neuromuscular disease: frequency of sleep-disordered breathing in a neuromuscular disease clinic population. Neurology 1996;47:1173–1180. White JE, Drinnan MJ, Smithson AJ, et al. Respiratory muscle activity during rapid eye movement (REM) sleep in patients with chronic obstructive pulmonary disease. Thorax 1995;50:376–382. Mellies U, Ragette R, Schwake C, et al. Sleep-disordered breathing and respiratory failure in acid maltase deficiency. Neurology 2001;57:1290–1295. Phillips MF, Smith PE, Carroll N, et al. Nocturnal oxygenation and prognosis in Duchenne muscular dystrophy. Am J Respir Crit Care Med 1999;160:198–202. Bach JR, Ishikawa Y, Kim H. Prevention of pulmonary morbidity for patients with Duchenne muscular dystrophy. Chest 1997;112:1024–1028. Toussaint M, Steens M, Soudon P. Lung function accurately predicts hypercapnia in patients with Duchenne muscular dystrophy. Chest 2007;131:368–375.